Three students from Ambala have devised a walking stick for people with vision impairment. The stick has ultrasound capability packed with artificial intelligence (AI) to allow users to get ‘AI’ vision guidance on the road. 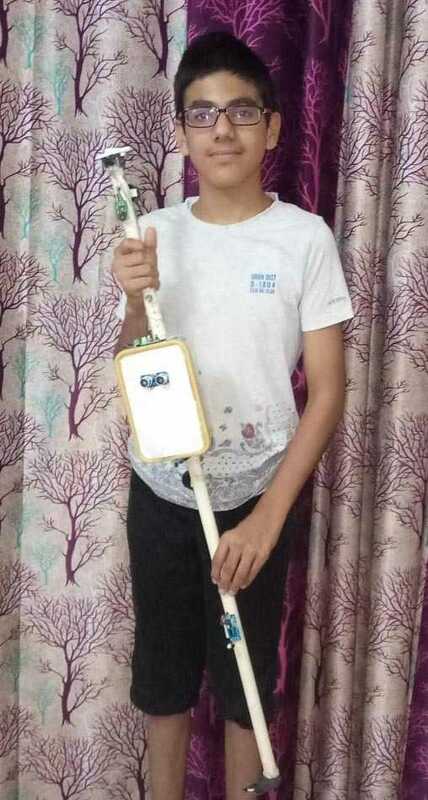 The ‘electronic blind stick’ has been invented by Aakash Kushwaha (class VIII of DPS Public School), Daksh Goyal (class VI of Cecil Convent School) and Aryan Aggarwal (class X of DAV Riverside Public School) of Ambala. They all take classes at Kidobotics in Ambala. The organisation provides STEM (Science, Technology, Engineering and Mathematics) education through robotics. The ultrasonic stick wirelessly measures the distance from approaching objects and converts this data into an audio signal. The blind stick is integrated with ultrasonic sensor along with obstacle, light and water-sensing capabilities. The micro-controller processes this data and calculates if the obstacle is close enough. “A speaker built into the cane guides users through voice command to go straight or turn wherever required. The cane also vibrates if it senses an obstacle on the path through ultrasonic sensors. The vibration gets stronger as the user approaches and gives a beep if the user is very close to it, alerting the users to head another way,” said the students.